During the late 1930s airline travel was starting to get popular in the United States as the country climbed out of the worst of the Great Depression. The Lockheed Corporation started design work on an air transport in 1939 that would be faster, carry more passengers and fly farther than the competition from Douglas Aircraft Company and Boeing Aircraft Company. That same year Howard Hughes had bought a controlling interest in Trans World Airlines and wanted an aircraft that would help him compete with American Airlines and United Airlines. 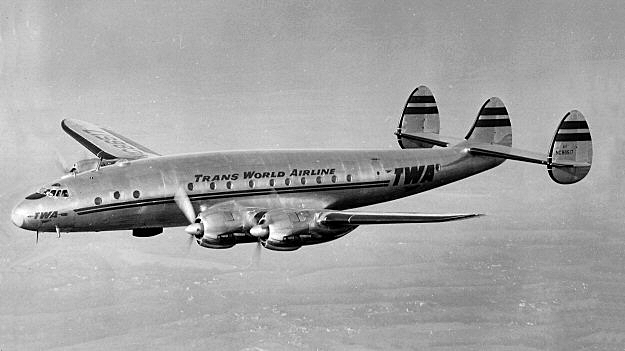 Based on Hughes’ contract, which guaranteed TWA the first 35 units produced, Lockheed came up with the L-049 Constellation. The Connie was one of the most graceful airliners ever produced, with four huge Wright R-3350 supercharged twin-row radials that could speed the plane to 350 mph – as fast as fighter aircraft of the day. The Constellation also had a pressurized cabin that could carry 44 passengers high above most bad weather. 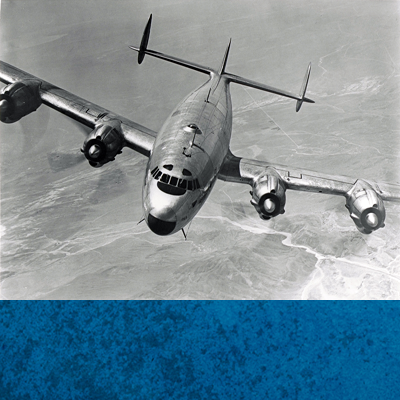 Before the first production model came off the production line, World War II was well under way and the U.S. government had taken over the Constellation as a military transport. Not until after the war would Lockheed’s first big airliner see paying passengers.